Activities of daily living (ADLs) is a term used by the healthcare industry to describe basic daily self-care activities. It’s also used as a metric to determine the functional status of seniors and people with chronic conditions. When older adults are no longer able to perform ADLs, which include dressing, bathing, and self-feeding activities, they may need help. However, not all seniors are willing to accept assistance. 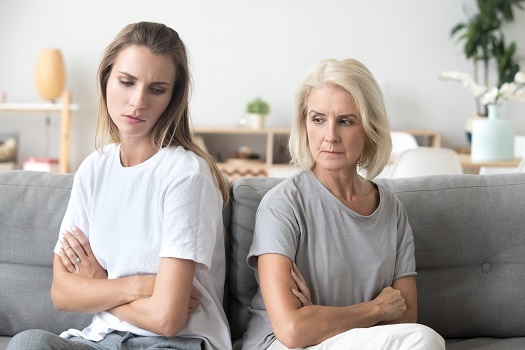 Here are a few steps you should take if your parent refuses your help. Unless an emergency situations arises, you can’t force your loved one to accept help. If he or she resists your offers of assistance, try to remain calm. Ask questions about the issues he or she is facing, and try to phrase these questions so they can’t be answered with a simple yes or no. For example, if your parent is having difficulty transporting the laundry to and from the laundry room, you can inquire about the laundry cart. Such an open-ended question places the blame for any laundry accidents on the cart, rather than your loved one, and it pushes the conversation forward without being accusative. If your parent isn’t on the defense, you may be more successful when offering assistance. The laundry conversation could transition into a discussion of well-reviewed local maid services or laundry carts designed to climb stairs. Aging adults who require assistance with the tasks of daily living can benefit from reliable senior care. Waterloo, Ontario, families trust Home Care Assistance to provide the high-quality care their elderly loved ones need and deserve. Our caregivers are trained to help seniors prevent and manage serious illnesses and encourage them to make healthier decisions as they age. If your loved one is having difficulty managing the activities of daily living, observe his or her behavior and try to determine the biggest challenges. Make a list that prioritizes your loved one’s issues, then hone in on the number one cause of concern. When communicating with a care-resistant senior, lack of progress can be intensely frustrating. If you have a list of priorities, you can go into each potentially awkward conversation with a plan of action to reduce some of the caregiving stress. Whether your elderly loved one needs part-time assistance with basic household chores or you need a break from your caregiving duties, the Waterloo respite care experts at Home Care Assistance are here to help. All of our respite care services are backed with a 100% satisfaction guarantee, there are no hidden fees in our contracts, and we never ask our clients to sign long-term contracts. For some seniors, long-time friends and family members hold the least sway over their decisions. While this seems counterintuitive, long-term relationships are complex, and they come with baggage. The logical assertions of a son, daughter, or friend may fall on deaf ears, but a discussion with a trusted outsider, like a religious figure or doctor, may prove convincing. If there’s an outside figure your parent listens to, ask the person to have a discussion with your loved one about assistance options. Many seniors resist assistance because they want to preserve their freedom for as long as possible. When you only offer only one solution, it may make your parent feel like there are no choices. Every time you broach the subject of assistance, come armed with multiple options. If your loved one gets to make the final decision, he or she may be more willing to accept your offers of help. There are many reasons seniors might need assistance at home. Some may require regular mental stimulation due to an Alzheimer’s diagnosis, while others might only need part-time assistance with exercise and basic household tasks. Home Care Assistance is a leading Waterloo home care provider. Families rely on our expertly trained caregivers to help their senior loved ones maintain a high quality of life. To schedule a free in-home consultation, give us a call at (647) 992 0224 today.